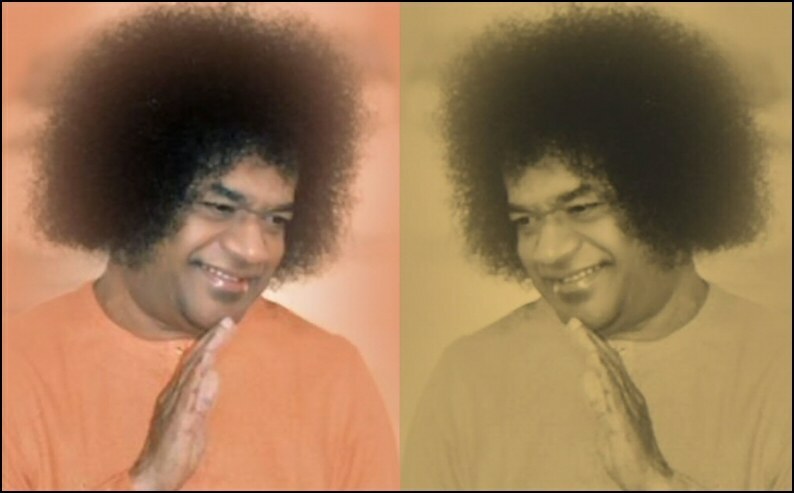 Sathyanarayana, later known as Sri Sathya Sai Baba was born on 23 November 1926, early morning, before sunrise. The Indian calendar calculates the day as starting from sunrise. So the day, according to Indian calendar was between Monday the 22nd and Tuesday the 23rd. The occidental calendar marks it as Tuesday 23rd, which has been accepted as the Birthday of Sri Sathya Sai Baba. His horoscope shows all aspects of a Mahapurusha. There is a conjunction of four planets in the Lagna (ascendant). They are the rising Sun, the Moon, Venus and Mercury. The Lagna has touches of Libra but the predominant aspect are of Scorpio. (Shuka Naadi says, ‘Born in Vrucchika (Scorpio) Lagnam, possessing the power of eight Siddhis’…. ). Most important aspect of the horoscope is the characteristic of Vipareeta Raja Yoga (Sudden unexpected turning to fame and success). The Sun is in the ascendant, signifying everything related to Dharma, God, rituals, worship etc. Symbolic merging of Sun and Mars connotes a spirit of determination and self confidence. He assures devotees, “My Sankalpa will prevail”. Saturn in association with the 9th Lord, assures great fame and endearing qualities. The planetary conjunctions also ensure appeal to the masses and longlasting fame, in spite of criticism and opposition. 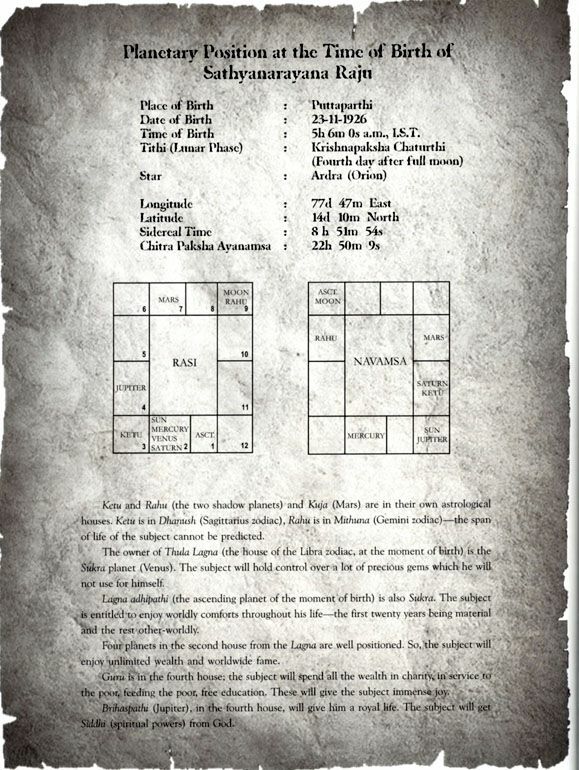 His short stature and red robes are considered to go with the nature of Mars, the Lagna Lord. Meticulous care to personal appearance and dress, luxuriant curly hair are all attributaed to the Sun, Venus and Saturn combination. Aspects of Mars are seen in slender waist and curly shining hair. His Soumya (plesing nature) is typical of Scorpio. Astrologers predict that after 1980, Ketu Dasa will commence for Him, when people will witness miracles surpassing previous phenomenion. After 1982, there may be a revealation, similar to 1940. After 1985, crucial events will show His great powers.